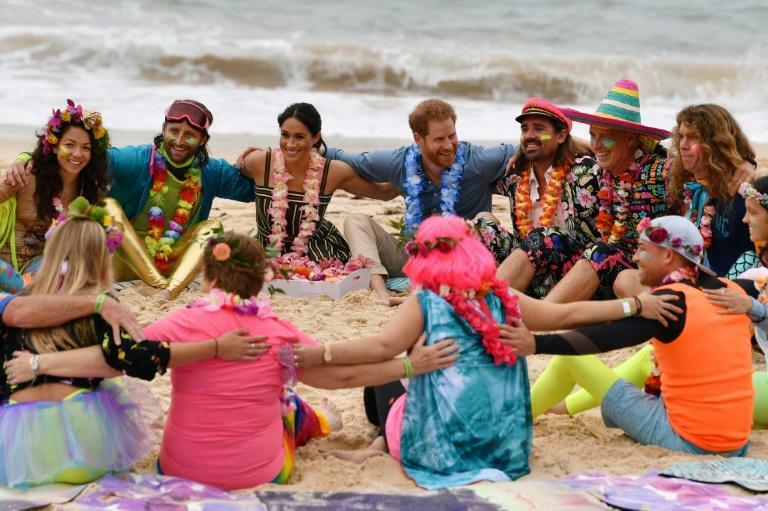 British royals Harry and Meghan kicked off their shoes and donned tropical garlands Friday as they hit Sydney's famed Bondi beach for the latest stop on their Australian tour. 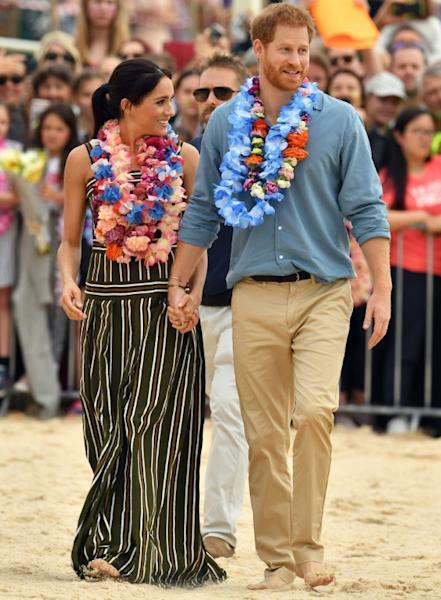 Expectant Meghan put on a summer dress and set aside her high heels, while Harry ditched his usual suit for chinos as the couple lapped up cheers from Australian fans and enjoyed Bondi's surf. Despite morning fog, the pair met local surfers enjoying winter swells and sat down on the sand for a long chat with leaders of the OneWave group, which focuses on helping people improve mental health by getting outdoors. Signs screaming "G'day Harry and Meghan" greeted the royal couple, who have received a warm welcome from fans throughout the start of their 16-day pacific tour. "You hear people that met the Queen when she came here (in 1954)" said 26-year-old fan Christopher Cundle, "and they are still talking about it now. "I can easily see that that is one of the things I will be talking to my grandkids and future generations about. It was awesome." 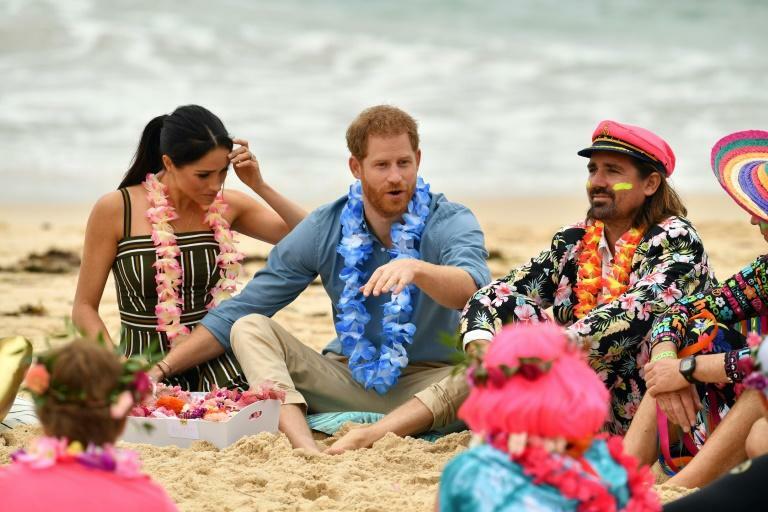 While half of Australians oppose having British monarchs as head of state, and the vast majority of citizens have carried on with business as usual during the visit, there has been sizable support for the celebrity couple at every stop. News that the Duchess of Sussex is pregnant has only made the crowds swell. She is the favourite royal of 11-year-old schoolgirl Mya. "I actually think it is amazing that she actually got to meet Harry and fall in love with him." Amid a torrent of fawning press coverage declaring Meghan the "Queen of hugs" and the prince receiving "buckets of love," the Australian Republican Movement is putting on a brave face. "The Duke and Duchess of Sussex are very welcome visitors" the group said at the start of the trip, pointedly adding that "Australians of all ages know the difference between this wonderful event and the questions of our nation's identity and future." In a 1999 referendum, 55 percent of Australians voted against replacing Queen Elizabeth II as head of state, although polls indicate support for republicanism has grown since then. The opposition Labor party has promised a plebiscite on the issue if it wins a general election expected in 2019. Later on Friday the prince strapped on a harness and scaled the Sydney Harbour Bridge to hoist a flag of the Invictus Games, a sports championship for wounded military personnel. On Monday the pair will go to Queensland's Fraser Island, the world's largest sand island, before jetting off to Fiji, Tonga and New Zealand. Coco Martin: I won't discuss my private life!